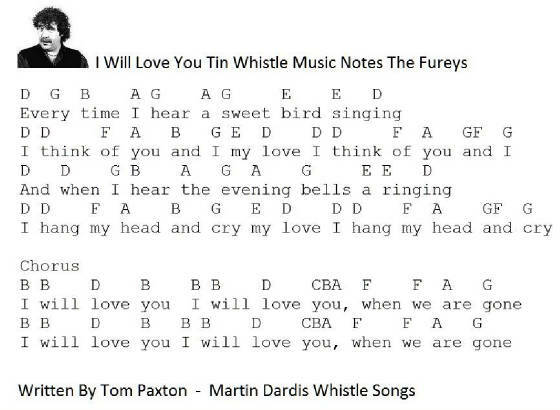 Written by Tom Paxton.Made famous in Ireland by ''The Fureys'' [What a band] Some of the chords here are ''fillers'' and don't need to be played , but the song will sound more intresting if they are played. Also recorded by Tickle The Pig who are an Irish folk band and whose youtube video I have used for this song. Well done lads, great version. The tin whistle sheet music notes are included, I had a go at playing it on whistle and must admit it's one of the easiest songs I ever played on whistle. When Tom Paxton recorded this song he called it ''Every Time'' and the Fureys called it ''I Will Love You''. The D note in the chorus is in the second octave which as you know you'll have to blow a bit harder. The other D notes are low. The three notes together on the word ''You'' are really needed to make the song more interesting, this is usually called ornamentation when playing whistle.